Brian Robson Rankin (Hank B. Marvin) and Bruce Welsh were pals and formed a skiffle group called the Railroaders. They intended to be a jazz outfit but when a rock' n' roll act failed to appear for a gig, the Railroaders filled in and enjoyed playing rock music. After the Railroaders split, Marvin and Welch teamed up with the son of Charlie Chester (famous English comedian) to form the Chesternuts and proved popular in the emerging coffee bar scene. Paul Samwell was the original bass player but was soon replaced by the more skilled guitarist, Terry 'Jet’ Harris'. 'Sammy' concentrated all his efforts on songwriting and was responsible for some of the finest examples of early UK rock’n’roll including Cliff Richard's hits 'Move It!'. They changed their name to the Drifters and were signed for Cliff Richard's first national tour. The combination proved a sensation. 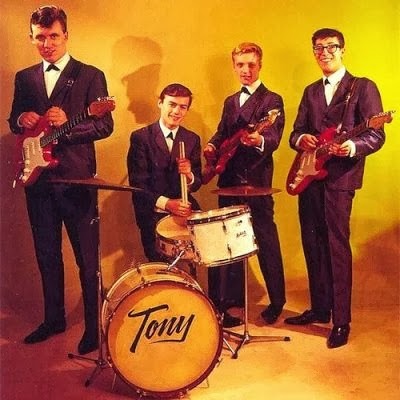 The Drifters were Hank Marvin (lead), Bruce Welsh (rhythm), Tony Meehan (drums), and Terry Jet Harris (bass). They were signed to his Cliff’s record label and promoted as Britain’s answer to the Everly Brothers. Capital Records ask if the group would change their name and Jet Harris came up with the Shadows, so the Shadows they became. When Jerry Lordan could not find lyric to his tune he asked the boys if they would play it as an instrumental and Apache was the group’s first hit with many more to follow. As Cliff’s resident backing band they had seven hits before their own individual success came. What made them so distinctive was the sound that came from Hank's red Fender guitar. Cliff had unwittingly brought it back for a US trip and Marvin made it his own. Hank was probably the first real guitar hero in the UK being much younger than Bert Weeden he appealed to the kids with his horn rimmed glasses (Buddy Holly style). It also gave hope and encouragement to all short sighted musicians who dreamt of rock’n’roll fame, including a young John Lennon. Jet Harris was certainly the most charismatic bass player around with the exception of Paul McCartney. Harris was asked to join the Shadows because he was one of the few people outside the US to own a new electric bass guitar. The Shadows had a stage presence with a walk to prove it and developed their famous shuffle to add more visual interest to their live act with Cliff. The hits kept on coming including FBI (1961), Frightened City (1961), and The Savage (1961) and Sleepwalk (1961). Wonderful Land (1962) was the first time the band used other instruments and incorporated strings. To the purists at the time this was considered a sellout. When Jet Harris and Tony Meehan left the Shadows to pursue careers as a duo they had a couple of hits before Jet was involved in a horrendous car accident which he never fully recovered from and eventually left show business. Tony Meehan went on to a career as a record producer. Brian Bennett took over percussion and a new bass player Brian Liquorice Locking joined the lineup briefly before being replaced by John Rostill. New sounds were incorporated, this time trumpets and many foresaw the end of the Shadows. Hank Marvin wrote Dance on with heavy orchestration and this was the first of their songs not to reach the top ten. An interesting irony was the single was displaced at the top of the charts by Diamonds played by Jet Harris and Tony Meehan. Differences of musical opinion meant the Shadows moved into cabaret fearing they could no longer compete with the beat generation. The rise and fall of Fingel Bunt (1964) was written by the band this time with Brian Bennett and Rostill. A brief return to the charts was short lived and the Shadows after 1965 no longer made it into the record charts. After three years doing cabaret and television and stage work Bruce Welsh left the group in 1968 and the band decided to call it a day. Tragedy struck when John Rostill was electrocuted in 1973 but the Shadows reformed to enter the Eurovision Song Contest with 'Let Me Be The One' which also gave them their first chart entry of the decade. They went on to a new series of hits including 'Don't Cry For Me Argentina' and 'Theme From The Deer Hunter (Cavatina)', both of which reached the top ten. The Shadows remain the most popular UK Instrumental group of all time. Later Hank and Bruce reformed the band with Australian John Farrer and Brian Bennett on drums. Their interpretation of standards was outstanding; just listen to their version of Cavatina, the theme to the movie Deer Hunter.